IP Result of anti-C1QA (IP:11602-1-AP, 4ug; Detection:11602-1-AP 1:300) with mouse liver tissue lysate 4000ug. The first component of complement, C1, is a calcium-dependent complex of the 3 subcomponents C1q, C1r, and C1s. C1q is composed of 18 polypeptide chains: six A-chains, six B-chains, and six C-chains. Each chain contains a collagen-like region located near the N terminus and a C-terminal globular region. Deficiency of C1q has been associated with lupus erythematosus and glomerulonephritis. 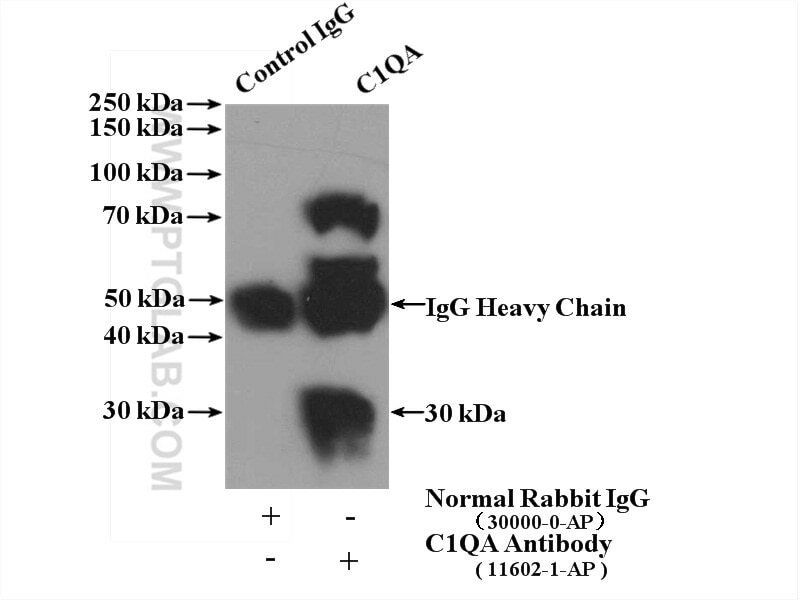 This antibody is raised against C1qA which is the A-chain polypeptide of human complement subcomponent C1q.